Want to restrict guns on your premises? Most states allow private property owners to prohibit weapons by putting up a notice or sign. These signs are fully compliant with state laws. 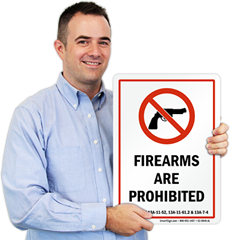 MySecuritySign offers No Guns Signs by State for private entities who want to prohibit gun owners from bringing weapons on the former’s property. Simply select your state from our drop-down list to view a range of No Firearms signs you can put up on your premises. Our designs feature the language your state legislature requires on a sign, accompanied by the relevant code under which the right to ban guns is laid out.